Whilst Shakespeare's genius is universally recognized, there is a hidden, secretive side to his work that is little known: the fact that he made use of a mysterious code that figures widely in the esoteric literature of the Elizabethan and Jacobean periods. The Bard of Avon was a master of such encoding, and his methods were continued, in the Folio of 1623 and in his various memorials, by those who had known him. However, Shakespeare was not the inventor of this code. Among the many arcane authors who made use of it before him was Michel Nostradamus, the famous French prophet and savant. 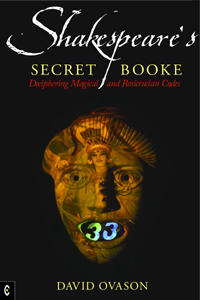 As David Ovason reveals, many leading esoteric writers - alchemists, occultists and Rosicrucians - contributed to this 'Secret booke'. Among the more outstanding English literary figures who used the code were the mysterious adviser to Elizabeth I, John Dee, the turbulent author of The Alchemist, Ben Jonson, and the more classically-minded Edmund Spenser, whose poem The Faerie Queene is the best-known esoteric work of the period. Shakespeare's Secret Booke reveals many other literary figures who together form a remarkable underground literary movement, including the most influential esotericist of the period, Jacob Boehme, and alchemists such as the English polymath Robert Fludd. Another was Shakespeare's contemporary, the youthful Johann Valentin Andreae, credited as author of The Chymical Wedding - a Rosicrucian work replete with sophisticated examples of encoding. The fact that all these writers used the same or similar encoding points to a secret teaching designed to be recognized by initiates. Ovason explores and, for the first time, reveals what Shakespeare alluded to as 'a Secret booke'. DAVID OVASON is the author of numerous books on historical and esoteric subjects. His most recent works include The Secrets of Nostradamus (1997), The Zelator: A Modern Initiate Explores the Ancient Mysteries (1998), The Secret Architecture of Our Nation's Capital (1999), The Two Children: A Study of the Two Jesus Children in Literature and Art (2001), The Secret Symbols of the Dollar Bill (2004) and The History of the Horoscope (2005).